and air of mystery, when we tried it, we wanted to tell everyone we knew. In our normal haphazard adventures, we wandered into a restaurant in SF called Coi and though it represents the best in fine dining in San Francisco, it is a surprisingly down to earth place to while away some time. The lounge area is done in soft textures and warm earth tones and sommeliers roam like the buffaloes of old. They suggested this lovely Sleepy Hollow Pinot Noir which they were pouring by the glass. One glass had me hooked. I needed to learn more about it and once having done this, wanted to tell the world, so the inspiration both to learn more about wine and also to tell people about it were sparked. Xandria had the bug too, researching it for a trip to Napa and she sleuthed out the tasting room tucked into mini-mall in Yountville which was half tasting room, half office, half decorator's showroom---magical proportions for a magical place. The staff was amazing and poured for us and went back to fish out vertical bottles for us, we ended up selling the random strangers on the Pinot before we realized that would cut down on the availability of the lovely '03 we were buying. We're givers! We didn't care. The tasting room figures prominently in several harum scarum adventures we have had since together and apart. If you have the opportunity to try this wine, go for it. Hailing from Monterey county in the Santa Lucia Highlands in a special place called Sleepy Hollow vineyard, Charles Hendricks has been sourcing grapes since 2001 and producing an amazing Pinot. Dark and lovely, with cla ssic Santa Lucia Highlands pinot perfume that emanates from your first dislodging of the cork, the flavors will not disappoint. Plums, pastrami, raspberries. cherry, mocha, vanilla.... It has a gorgeous acidity to make it pair deliciously with many offerings and is lovely by itself. 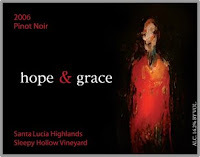 Charles names the wines after his daughters, Hope and Grace, and the label is a mesmerizing painting that hangs in the tasting room in Yountville, which ties back to his personal touch with fine dining since he acquired it from Modesto Lanzone (I still miss Enoteca Lanzone! ), who figures prominently in both the modern art and culinary history of San Francisco. Last year, even though I was practically handicapped by jet lag, I met so many interesting people who have become sources of fun, wisdom and inspiration that I am counting the hours until this year's events. I am extremely lucky that while 2009 is not going to win any gold medals, everything is going pretty smoothly over at Chez Liza. I know that is not the case with everyone. 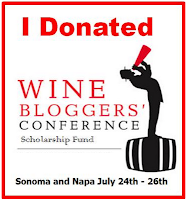 But the WBC is such an important event for wine bloggers, as soon as I found out about the scholarship program I jumped in with both feet to help. Even volunteering to act as treasurer and getting all crafty cobbling together blog badges and T-shirt decals. Why? 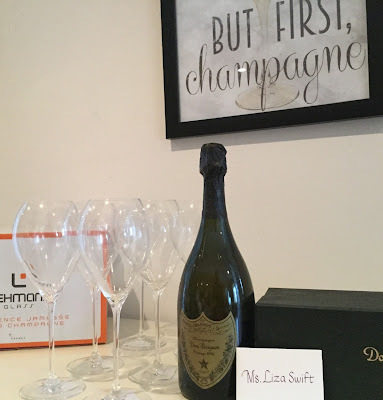 Because helping someone who might otherwise have to sit out this year means someone with a lot of passion around wine, writing and adventure gets to come. Different perspectives are an invaluable aid in learning about how the moon looks on the other side of the world. Someone not like me can bring a fresh perspective to the most tired topic. I am very much looking forward to seeing friends at the WBC, but am just as excited by the prospect of meeting new people. Our committee spent quite a bit of time focusing on what donations can provide back to the community. One reason is that by helping to sponsor someone to attend we help ourselves too. The wineries and business focused contributors might fund someone who will someday make a vital connection for them, become an invaluable employee someday or just be their biggest booster. Connections are important. And in the world of one-to-one marketing enabled by social media, everyone is more than important. We're necessary! So, if you are able to give, please click and contribute. Maybe you can sell something on eBay and repurpose an item sitting around gathering dust so that a deserving blogger will get a chance to brighten us all a little. And, in doing so , you will earn the privelege of getting to iron on your very own t-shirt patch. So whether you are planning to be a "Naughty Wine Minx", say "Screw it More Wine!" or delicately advise eBob, plan to enhance your T-Shirt statement with a lovely I Donated! patch. Hand made with love by a BrixChick! PS: If you are a blogger in need of a scholarship, please click on the same link to apply! Are you a “socially-conscious” wine drinker? 1.I drink it out of anything from a glass bottle to a tetra-pak to a plastic cup or even a styrofoam cup. Just give me my wine, dammit. 2.I always recycle my bottles, corks and screwcaps. 3.I cannot enjoy imported wines knowing the cost of the "carbon footprint" of transporting them. 4.I wonder how the vineyard laborers are treated in the countries producing wine. As Earth Day dawns upon us every April 22nd, I begin to look at my eco-habits closely. Do I recycle enough? Do I buy products that are “earth-friendly?” Just how big is my carbon footprint? How much organically-grown products do I consume? And how much does all this really matter. Yeah, I ve got a lot on my mind...and yeah, I do look for organic wines. But I recently found some wines labeled as “Fair Trade Certified” and I had to try them, figuring they must be "earth-friendly." First of all, who knew that wines could be Fair Trade Certified? Coffee and chocolate yes, but wine? Apparently there is a large market in the UK for these types of wines and the US is slowly following suit. The wines that are certified come from South Africa, Argentina and Chile. • Fair and safe labor conditions, freedom of association, and living wages. Forced child labor is strictly prohibited. • Community development funds to invest in the future of their farms and families. • Sales of Fair Trade Certified products have grown dramatically. Between 2001 and 2006, there was a 53% average annual growth rate for all Fair Trade Certified products in the U.S.
Well, I hope Trader Joe's is listening! medium ruby color; red fruit and black pepper from the Shiraz, herbal notes from the Cab. On the palate: smokey notes along with lush finish with a medium linger balanced acidity and firm tannins, very fruit forward. You know how South African wines can have that smokey, burnt rubber taste? Well, this wine improved the second day as the smokiness evaporated. This wine comes from the Du Toitskloof Winery of the Western Cape. Thanks to the Fair Traide certification the laborers of this winery have benefited from programs such as daycare, adult literacy programs, community sports leagues and acquiring computers. This deep garnet red blend has a fruity nose of plum and blueberry plus notes of mocha, leather and anise. It has bright acidity,firm tannins and a long linger on the palate. The grapes for this wine come from 4 different vineyards in the Mendoza region of Argentina. The taste of this wine improved as I ate it with my roasted veggie pizza. Have it with food. 3 out 5 stars. I guess every glass you drink really does matter. It matters how we treat the Earth when farming, and how we transport goods across the globe. And it matters that vineyard laborers are being treated with justice and equality. So why not drink some good wine and support some good causes??? It just feels (and tastes) good.